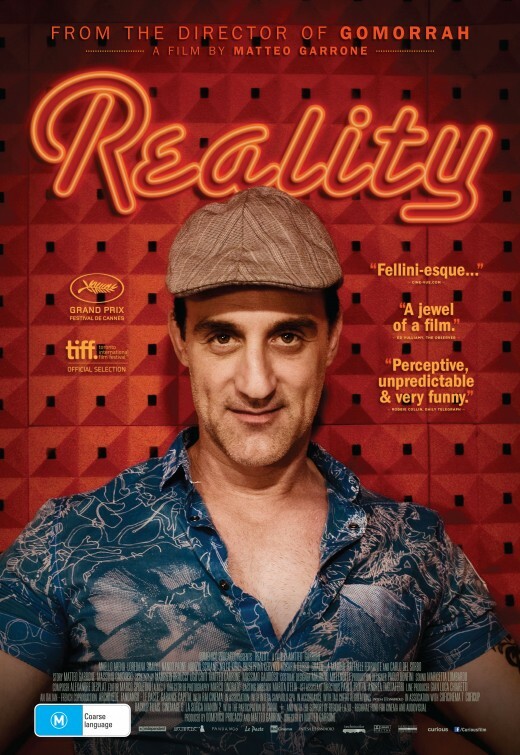 Don’t believe the marketing: Matteo Garrone’s new film, Reality, is not “very funny” – it has no intention of being so – nor is it “Fellini-esque”. If anything, it is grounded in the harsh realism of De Sica, combined with the operatic camera moves of Coppola. It is a brutal, frank, painful and highly meticulous look at an ordinary man undergoing a very modern crisis amidst a very simple life. Luciano is a fishmonger in a very pretty square in a very working class area of Naples, which is presented as a very working class, day to day city. He has a couple of little girls; with his wife Maria and colleague Michele he runs a small scam on-selling promotional kitchen devices. It’s hardly organized crime, and it’s completely victimless, and it only serves to give him a living wage. He is also, essentially, content, although the spectacular opening sequence suggests he has frustrated dreams of being some sort of entertainerOne day his daughters call him from a shopping mall; the reality television show Big Brother is holding general auditions for its next season. They insist he come down and audition; he does, and his life is changed forever, but not in ways anyone could have predicted. Garrone is a major filmmaker. His previous feature, Gomorrah, was one of the best of 2008; it was a sprawling, ultra-realistic examination of organized crime in the Neapolitan region, perhaps the grittiest and most accurate mob movie ever made. Reality is much more contained, being, in essence, a character study, but he still shoots it with an epic perspective, with massive camera set-ups and moves capturing the incredible beauty of a worn, torn and overburdened part of Italy that is worlds away from the Rome and Tuscany we may be used to. I can’t think of another director who moves the camera so much; Garrone’s is almost never still. He favors a pan left to right and top to bottom, very much in Coppola’s style, usually uncovering, in beautifully blocked shots, spectacular Italian faces and bodies engaged in the business of everyday life. His actors really do seem to real to be actors; I suspect many of them are not, at least on a professional level. This is not to say they’re not believable; quite the opposite: they are totally believable, and the effect is almost that of observing documentary subjects within the rigors of a completely controlled, detailed and highly polished frame. Aniello Arena, as Luciano, is a revelation, in his first ever role. At times recalling the forty year old De Niro (and his character is not at all unlike Rupert Pupkin in King of Comedy, he is the movie, and he’s brilliant. Luciano is a tricky role that could destroy a mannered actor, but Arena is never less than completely natural while still commanding our attention. He has a a natural charisma without being showy in the slightest. If I was the casting director for Martin Scorcese, I’d be signing him to a first look deal now; Boardwalk Empire may also want to give him a call. Reality is not a satire about reality television, so don’t go if that’s what you’re looking for. It’s not even a satire (despite the marketing), and it’s certainly not a comedy. It’s a sad, meaningful examination of contemporary dreams in contemporary daily life, and it’s glorious. I plan to follow Garrone’s career with precision, because I’m so thankful his films are so precise.